House decor is a very personal topic. Each family has its own tastes and priorities when it comes to filling their residence with the things that will make life more convenient … and more beautiful. Flooring is no different from other home accessories in this respect. The good news is that these days, DIY home decorators can find flooring solutions that will suit just about everyone. Decide what's important to you in a floor covering and make your choice, armed with the facts on ceramic tile, concrete, hardwood, linoleum, vinyl, and laminate flooring. Vinyl flooring is extremely sturdy and resists staining, fading or discoloration from the sun, wear, and scratching. High quality laminate is durable, but in cheaper brands, the upper layer may separate from the base. Concrete flooring is tough and long-lasting both indoors and out. Speaking of the great outdoors, if you are planning to install a tile floor on a patio, deck, pool surround, or balcony, make sure that you purchase dedicated tile for exterior use. Hardwood shines in this category. Repairing nicks and scratches is a simple affair. All you need to do is sand them away and reseal. When ceramic or porcelain tile floors or flooring made of carpet tiles becomes damaged, you can remove and replace just one or two pieces as necessary. Carpeted floors, especially wool, are the most resilient and the pleasantest to walk or sit on in either cold or warm weather. 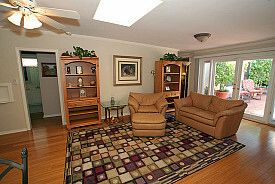 Wood and laminate floors are also fairly resilient and comfortable in all seasons. Hardwood, concrete, and tile are hypoallergenic (although do be careful about repurposing vintage ceramic tile as flooring -- it may have a toxic lead glaze.). Vinyl and other synthetic flooring materials sometimes off-gas dangerous substances -- look for low, or preferably no, VOCs. Carpet might harbor dust, pet dander, mites, and other substances that can trigger allergic rhinitis. Linoleum as a flooring solution has been around for decades. Few people realize, though, that true linoleum (as opposed to PVC lookalikes) is an eco-friendly material, produced from a mix of wood byproducts, linseed oil, and minerals, which is mounted on a backing of canvas or burlap. Hardwood floors made from sustainable, fast-growing wood sources, such as bamboo, also score well in this category, although their ranking drops if they require long distance transportation. Concrete flooring can simply be hosed down if you have a floor drain. Tile is similarly easy to wash, though cleaning the grout will complicate maintenance. Vinyl is relatively low care too, as long as any spills are mopped up quickly and manufacturer's instructions are followed. Hardwood flooring is a huge favorite among American homeowners for its rich, natural beauty, which only improves with age. (It's also popular among house hunters, and will add to your home's appeal if you plan to sell.) Tile is another lovely option, with a wide selection of colors and designs. A surprise entrant in the good looks category is concrete, which can be made to resemble just about any material, including wood planks or marble flooring, and offers an amazing range of decorative finishes. The price of vinyl floor installation is usually the least expensive at $1-7 per square foot including materials and labor. Linoleum floors and laminate are also very reasonable, at $2-9 and $3-7, respectively. Wood and ceramic tile flooring cost more ($6-15 and $4-12 per square foot), but due to the relatively long life spans of these substances, may work out to be the best value over time. Cost of carpet is the most variable of all, according to material, style, and quality.